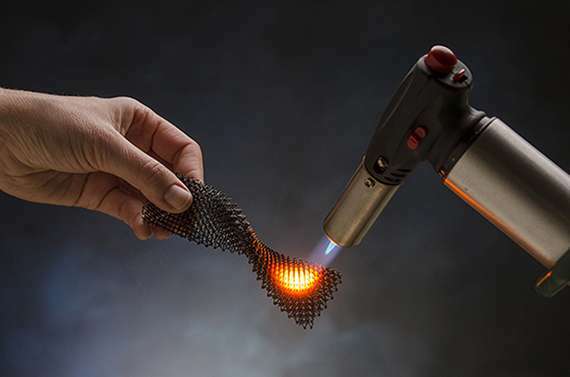 HRL's Senior Chemical Engineer Zak Eckel and Senior Chemist Dr. Chaoyin Zhou invented a resin formulation that can be 3D printed into parts of virtually any shape and size. The printed resin can then be fired, converting it into a high strength, fully dense ceramic. The resulting material can withstand ultrahigh temperatures in excess of 1700°C and exhibits strength ten times higher than similar materials. The HRL team's research paper, "Additive Manufacturing of Polymer Derived Ceramics," has been published in the January 1st issue of Science. That is going to be a very useful process. I think those guys have a winner there.